to take cover at the "first sight of a Yankee" to avoid being shelled. The streetcars to which he was referring were premotorized double-deck cars drawn by mules. Eddie's mother had died when he was 4. In his autobiography, he lamented at his inability to remember her, "taking me on her knee, holding my little face between her hands, and pressing her loving lips to mine or tucking me into my little crib and kissing me good night -- as all mothers do." He was convinced she had done all those things but sadly he couldn't remember. The one memory he did have was his mother leading him into her room and spanking him with a slipper for some forgotten childhood misdeed. Kells' father, Dr. Charles Kells Sr., was a family dentist who practiced his craft in the lower story of the three-story family home. As a teenager Eddie was incorporated into his dad's practice doing odd jobs. He "saw and heard a good deal more of dentistry than he would under other circumstances," he wrote. He matriculated at New York Dental College in 1876, graduating two years later -- the two-year curriculum being the norm at the time. While in New York, he befriended several lab technicians at Thomas Edison's Menlo Park lab in New Jersey, spending considerable after-class time there. "Here I saw many interesting things in electrics, and, among other things, some of the first electric incandescent lamps [light bulbs]." These experiences at the Wizard of Menlo Park's lab led him to a lifetime of tinkering and a fascination with the new age of electricity then in its infancy. "The tallow candles and oil lamps [of my youth] gave way to gas and then to electricity," he mused nostalgically two years before his death in 1928. He marveled too at how transportation had evolved during his lifetime "from sailing ships, to trains, subway and elevated 'electric cars,' steamships, cars and to cap the climax, by aeroplane and dirigible." November 12, 2013 -- In April of 1862, 6-year-old Charles Edmund "Eddie" Kells Jr. stood on New Orleans' Jackson Avenue pondering his impending doom. Union Adm. David Farragut had run his flotilla of 18 men of war up the Mississippi River into cannon shot range of the city. Union troops led by Gen. Benjamin Butler were on the outskirts of New Orleans poised to invade. 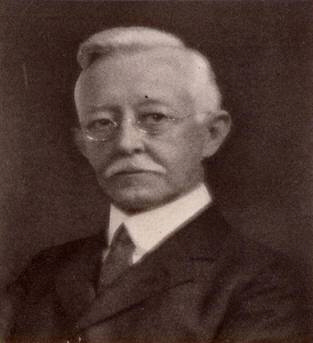 Charles Edmund Kells, DDS (1856-1928).